The Genesee & Wyoming group of railroads is fairly new to Michigan. G&W has assembled the following shortline railroads: Huron & Eastern (HESR) serving shortlines stretching out in many directions from the Saginaw area to Bay City and Midland, Brown City, Caro and Croswell in the "thumb". They also own and operate lines from Grand Rapids east to Ionia, and north to Manistee and Ludington, as well as north from Holland to Muskegon and Fremont. G&W also owns the Huron Central Railway which runs east from Sault Ste. Marie, Ontario to Sudbury. Traffic on these lines is varied. 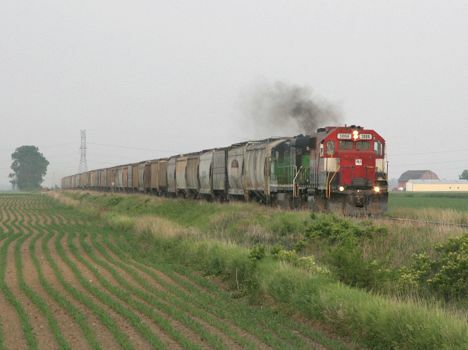 Branch lines in the thumb depend heavily on grain and sugar beets. Dow chemical facilities are served in Bay City and Midland. Power plants using coal are on line at Essexville (near Bay City) and West Olive (near Muskegon). Website: Genesee & Wyoming Inc.